Almost two years ago now, there was a giant snowstorm in Atlanta. No one could get anywhere, so I sat inside my home and made an endless fire. That weekend, I had an awful sense that a significant part of my life was ending. And yet what I saw from my windows was spectacularly beautiful. 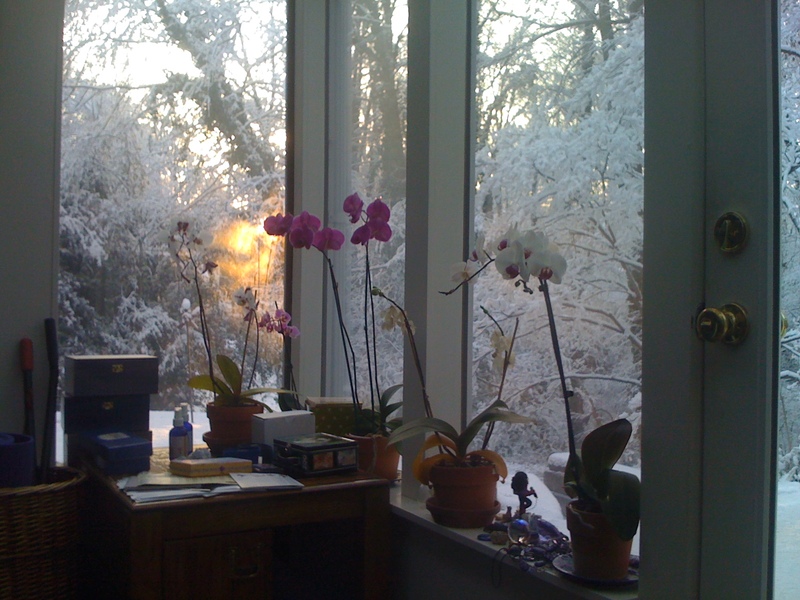 As I woke that morning, I groggily went downstairs and saw the dawn break over the orchids in my studio. The snow lay quietly outside. I bundled up and took pictures of the snow softly covering the angel in my garden. The angel looked like she was holding a bowl of snow as an offering just for me. My heart was breaking. Even though I was not sure exactly how this passage of my life would affect me, I knew that the changes that were coming were huge. It felt very difficult. I had no one to talk to and no way of putting anything into perspective yet. I wondered how I was going to get through the weekend. I turned to my crafts for an immediate answer. I made myself a necklace of chrysoprase and herkimer diamonds. The light green stones of the chrysoprase held the energy of the spring that was not yet unfolding. The imperfect herkimers in between the large round chrysoprase stones held the energy of attunement, reminding me that all was in divine order, even if I did not yet understand. Then I made a fire and cast on the stitches of a large purple shawl that I wanted to keep me warm during meditation after yoga. I knitted for hours. But unlike with my beading, it was not possible for me to complete the project that weekend. I wore the necklace immediately and to me every time I put it on to this day, it reminds me of hope. But the shawl lay on my knitting needles, incomplete for well over a year and a half. I was not sure whether or not I should finish it. Would I feel the grief I felt that weekend, or would its beauty surpass the sorrow, just as my necklace had done? I was not sure. I debated whether or not to give it away for someone else to finish. Today I finished my shawl. It had finally reached the right length. I would open the drawer where I kept it and finally fell in love again with the fuzzy warm wool. I cut the fringe and took out a crochet needle to add the finishing touches. Like my necklace and like everything I make for myself, it’s wabi sabi – it speaks to me of the beauty of imperfect things. The power of what I make for myself is in the embodied acceptance of the transience of all things beautiful. Even though I remember the grief I felt as I cast on the first stitches, my shawl now feels complete, as I have finally finished this cycle of my life, which encompassed two of the most difficult years I have ever experienced. The shawl now reminds me of both the beginning and the end. Sometimes I look out the windows of my studio and the view is so precious to me I wish I could hold on to that moment forever. But that view passes as the seasons pass, and another view unfolds, also precious to me and I then wish I could hold on to that moment. But I never can. Also today, my new Manduka PRO yoga mat arrived, in a special edition Black Magic color of deep purple, along with a fig-colored bag to carry it. I do not know what to expect from my new mat, but it feels good. It feels hopeful. I realized that everything came together today – my new yoga mat, my carrying bag and my purple shawl for meditation after my practice. I had the sense that I now have everything I need to begin the next phase of my life. I am hoping this cycle of grief has finally passed. I am prepared for whatever is to come. Photo: View from my studio the morning I began my purple shawl. Almost two years ago now, there was a giant snowstorm in Atlanta. Photo: View from my studio the morning I began my purple shawl.